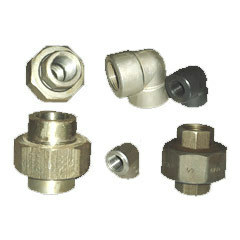 Not only our endeavors lying in the production of industrial pipes and pipe fittings, but we are also one of the leading stockists in the same field. Constructing our range of industrial pipe fittings, stainless steel pipe fittings, steel pipes, steel tubes and plates and other industrial pipes using superior grade metal, we are instrumental in catering to the needs of construction and engineering industries. Our range includes carbon steel tubes, alloy steel plates, carbon steel fasteners, steel nuts, steel plates, titanium wire, steel sheets, titanium bars and steel seamless pipes. We are an ISO certified organization that makes us responsible in making our range in compliance with high standards of the industry. By supplying our range with heat number mentioned in manufacturer's (Mill) test certificate and garnering associations with third party inspection agencies, we are able to fulfill all the critical requirements of NACE, IMPACT, Hydrogen Services and HIC. Also we provide our clients with a free sampling policy that helps them choose their way out.